Where the first novel focuses on the chaos theory and sporadic events, this second novel is propelled by the theory of evolution and adaptation. As InGen’s original “Park” project declined and went into bankrupt and secrecy, they left behind something more sinister: a Lost World. Ian Malcolm rejoins us for this book with some colleagues, Sarah Harding, Thorne and his assistant Eddie; some stowaway kids, Arby and Kelly; and an overzealous dinosaur obsessed researcher, Levine. Unknowingly, Levine is being followed around by Lewis Dodgson and his cronies, as Dodgson’s style is to steal research from those who do the hard work, and make it his own. With Ian Malcolm shutting down Levine’s theory that there may be diseased dinosaur-like creatures discovered in the costa rican area, he makes the mistakable effort of going out to prove his theory of an existing Lost World. Things go wrong, and he goes missing and it’s up to Ian Malcolm and the others to find and save him; but will Dodgson interfere? Dodgson seems no different from Hammond (Jurassic Park) in that he wants the dinosaurs for monetary gain. He feels that if he could obtain the eggs from the different dinosaurs on the island, he could start up his own hunting preserve where wealthy people can hunt them. What everybody (especially Eddie) doesn’t understand is that with their young, dinosaurs are no more different than most other animals who would do anything to protect their family. I liked the idea of this book taking a different turn from the first novel, Jurassic Park, as it was driven by theories on evolution, adaptation and extinction. Although not as thrilling and suspense-filled as the previous book, The Lost World makes a point in making an example of the dangers of misinformation, rumors, unreliable sources and varying views on Earth’s development. I still love Ian Malcolm’s wit and deep insight into the philosophy and science of life. I also loved how this novel exemplified different ways in which us humans influence the adaptation and evolution of other animals. The candy bar, which was both foreshadowing (I sensed that littering would lead to some hard times for the crew,) and representative of how animals adapt to survive how they can (dinosaurs apparently are quite fond of candy bars.) The crew ended up staying on the island because they figured they might as well get some research out of the animals, but they soon found out that their mere presence changed the normal ecosystem of the island. “That basic truth became the Heisenberg uncertainty principle: that whatever you studied you also changed.” (271) Building into their environment, stepping into their territory and trashing their ecosystem changes evolution and animal’s adaptive abilities, which may lead to extinction alone. 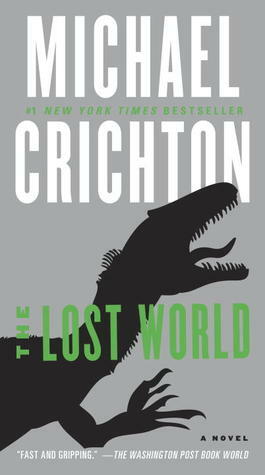 The Lost World, which is filled with the fantasy of observing evolution and extinction, is a wonderful informative novel, just as the first Jurassic Park is. Although lacking in the same thrilling excitement, this second novel had me energized and moving through the book with the crew as they explore and learn how interfering with a delicate ecosystem can be catastrophic for everyone. P.S. If you’re thinking that this book will be like the second movie, you will be disappointed. I was only disappointed that the movie was not like this book, and that the director & screenwriters just decided to do whatever they wanted. They even made unnecessary changes such as giving Ian Malcolm an African American daughter (which always had me scratching my head...) and the plot was hardly followed at all. Reading this book turned me against the movie. Since this was the last book in the Jurassic Park series, I have no idea why moviemakers decided two more movies needed to come out (Jurassic Park IV comes out in 2014,) I’ve never liked the third movie, and now I know why it’s so different from the first two.